When you think about packing a waste-free lunch, what do you think of? Probably nothing too exciting, right? After all, it’s lunch. How cool can you get with lunch? Well, thanks to To-Go Ware’s Tiffin Action Pack, you can get cool with lunch. Really cool. And I’m addressing this to kids as well as adults. It has been estimated that on average, a school-age child using a disposable lunch generates 67 pounds of waste per school year. And, that’s the stat for kids. How much waste do you think us adults are generating? Scary. So let’s dive in and find out how the Tiffin stainless steel lunch container can help us eliminate all that waste. And yes, there’s a tasty 20% off coupon! If you happened to catch Oprah’s monumental Earth Day episode, then you might have seen To-Go Ware on her show. Oprah loves To-Go Ware’s products, and with good reason. They’re not only eco-friendly, but these products don’t sacrifice the cool-factor. You get the best of both worlds here. The only other thing you’ll need for a waste-free lunch is a cloth napkin. Cool Benefit#1: The cool thing about To-Go Ware’s Tiffin is that because of its 3-tiered structure, you can pack a variety of yummies and they won’t spill or leak onto each other. 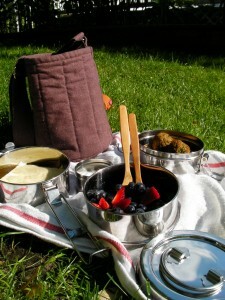 For my picnic this weekend I packed a berry salad, falafels, pita bread, and a yogurt dill sauce (YUM!). As you can see in the picture, everything went into its own compartment. And I could easily carry it all in that cool little carrying bag. There’s even a pocket for the bamboo utensil set. 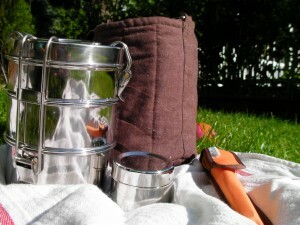 Cool Benefit #2: I also love the Tiffin because it’s so easy to use. With other stainless steel lunchboxes, I have to put one food in each, and then pack them in a canvas bag. Well, there’s tons of room in that bag. I end up packing three separate containers, and they slide all over the place. The Tiffin Action Pack is compact, and maximizes every inch. Your lunch goes nowhere once its in the canvas carrying case. This makes carrying it to school, or on your commute to work, extremely easy. You can just sling it over your shoulder and go. Cool Benefit #3: The Tiffin is also extremely well made. When you latch it closed, it really feels closed. There is NO WAY the lids are going to come off (because there are a total of 4 latches) in transit. So, short of running over this thing with a steamroller, your lunch is going to stay safe. End of story. Yes, There’s A To-Go Ware Coupon! Thanks to Oprah, there’s a coupon on To-Go Ware products for 20% off. I believe it’s good until July 30, 2009. There was nothing I didn’t love about the To-Go Ware Tiffin Action Pack. It’s compact, it’s very well made, and it’s very, very cool looking. I was wondering…do they work for soups? Some other stainless steel containers aren’t suitable for liquids. I didn’t put any soup in mine yet, but I know what you mean. I have two stainless steel Lunch Bots, and also another style from HealthyKitchens.com. Those three won’t handle liquids if they’re tumped upside down. And my guess would be that the Tiffin is the same. I think that soup would be safe as long as the whole container didn’t tip, but if did, the soup would run. If you want to carry soups, I’d recommend a Sigg thermos. I just bought one, and it’s AMAZING. It keeps my coffee and soups hot for 6+ hours. And I’m not exaggerating there. The Sigg thermos is going to run you around $30, but the thing is indestructible and very well made. It should last a very long time. I love mine, and think the investment was well worth it.